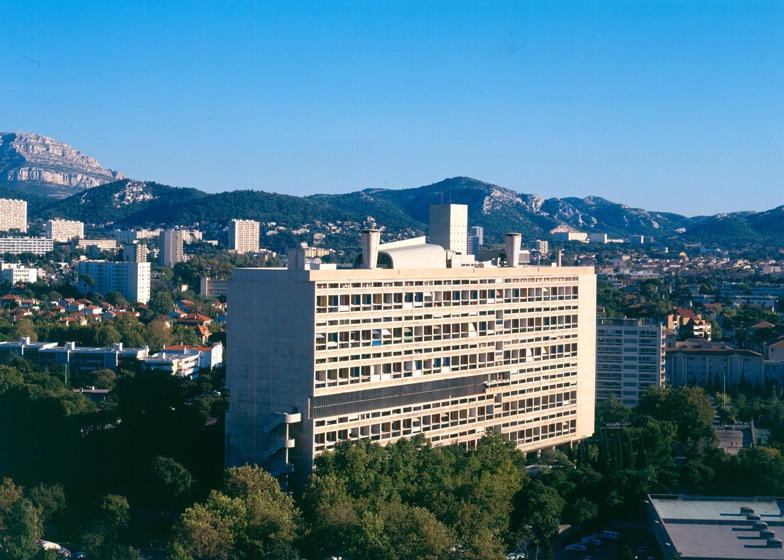 Brutalism: Le Corbusier's first Unité d'Habitation is arguably the most influential Brutalist building of all time. With its human proportions, chunky pilotis and interior "streets", it redefined high-density housing by reimagining a city inside an 18-storey slab block. Completed in 1952 in Marseille, the building took Le Corbusier's most famous quote – that a house is "a machine for living in" – and applied it to an entire community. The result was a self-contained concrete vessel that is structured like an ocean liner. The architect called the building La Cité Radieuse, or "the radiant city", and it has successfully accommodated a mix of uses ever since completion. Its 337 apartments can accommodate 1,600 residents, but it also boasts two shopping streets, a hotel and a rooftop terrace. 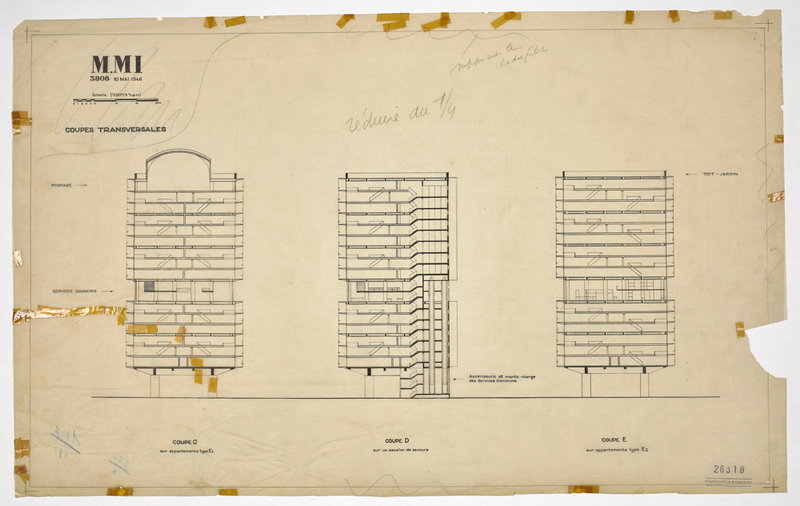 Le Corbusier believed the tower block was the solution for rehousing the masses that had been displaced during the second world war, and that high rise building could be used to create spacious city homes with the same amenities as a typical street. With Unité, his aim was twofold. To "provide with silence and solitude before the sun, space and greenery, a dwelling which will be the perfect receptacle for the family", and to "set up, in God's good nature, under the sky and in the sun, a magisterial work of architecture, the product of rigour, grandeur, nobility, happiness and elegance". 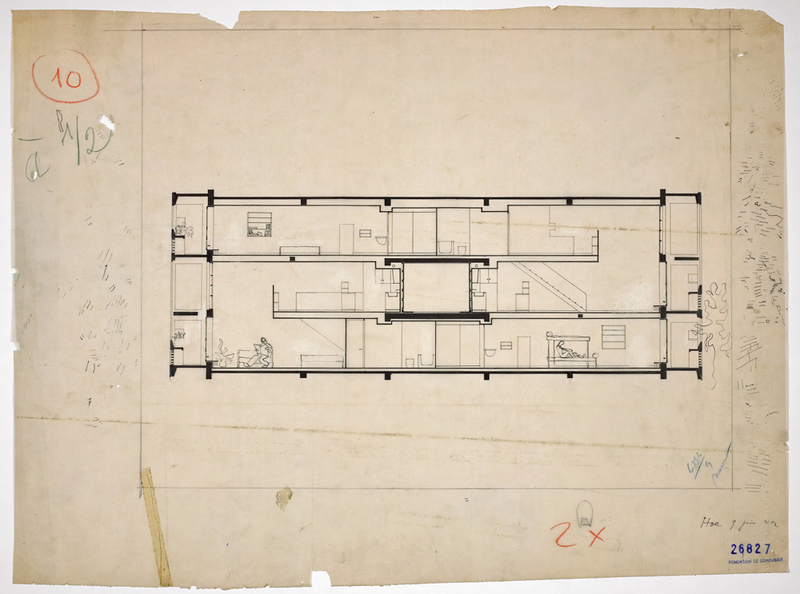 Rather than employing the smooth white surfaces that typified many of his buildings, Le Corbusier chose to create the building in béton-brut concrete, which was textured by the wooden planks that had provided its formwork. This prevented the need for a steel frame, making it the most cost-efficient solution. In an address to council minister Eugène Claudius-Petit on the day of the project handover, the architect described the building as "the first manifestation of an environment suited to modern life". "Made for men, it is made to the human scale," he said. "It has also the robustness which is inherent in modern technique, and it shows the new splendour of bare concrete." La Cité Radieuse is located at the heart of a large park. With a length of 165 metres and a height of 56 metres, it rises over the surrounding treetops with its base raised up on pilotis and its two main elevations facing east and west. These elevations comprise a series of balconies and deep-set windows that reveal the spacing of the internal floor plates. Le Corbusier developed this grid using a proportional measurement system based on his Modulor Man – a concept that combined the proportions of a six foot tall human figure with the mathematics of the golden section. Inside, narrow flats are mostly arranged as two-storey duplexes with a double-height living room at one end. One level of each apartment stretches the full 21-metre depth of the block, creating a layout where pairs of homes interlock around a central access corridor. Unlike a typical apartment block, this arrangement meant that these access corridors – known as "streets" – only needed be accommodated on every third floor. There are just five in total. When the building first opened, the seventh and eighth floors were home to an assortment of shops, eateries, galleries and a hostel where residents could invite guests to stay. Sixty years on they are much the same, although the hostel has become a hotel and many of the shops have been taken over by more specialist businesses, from medical practitioners to architects. The roof offered even more amenities, including a nursery, a running track and pools for paddling and swimming, but these days the space hosts an art programme masterminded by French designer Ora-Ïto. In his 2012 book Museum without Walls, architecture critic Jonathan Meades wrote: "The roof of l'Unité is a transcendent work: it is as though Odysseus is beside you. In a few gestures, it summons the entirety of the Mediterranean's mythic history. It is exhilarating and humbling, it occasions aesthetic bliss. It demonstrates the beatific power of great art, great architecture." There are 23 different types of residence within the building, varying from small one-person homes to generous family units, and every home has at least one balcony. "The Unité d'Habitation is an incredibly powerful sculpture, and the feeling of living inside a work of art is a daily reality," said Jean-Marc Drut, who occupies apartment number 50. In 2008 Drut started an initiative inviting different designers to restyle his home, and allowing members of the public to visit. So far the space has been refitted by names including Jasper Morrison, Ronan and Erwan Bouroullec, and Konstantin Grcic. The strict grid, framed by thick sound-proofed walls, means that reconfiguring layouts is largely impossible, but the designers are able to entirely restyle the space, providing they don't change the colours of the walls or alter any of the existing furniture. "The exhibitions help to re-activate the space and anchor it into the 21st century, showing how relevant it is still," he told Dezeen. Today, La Cité Radieuse is still home to many of its original occupants. It is recognised by UNESCO as a world heritage site, and has remained a favourite with architects – even before it was complete, late Italian architect Gio Ponti branded it as "a true monument in the history of French construction". Five other Unités were also built, including one in the French town of Nantes-Rezé and one in Berlin.